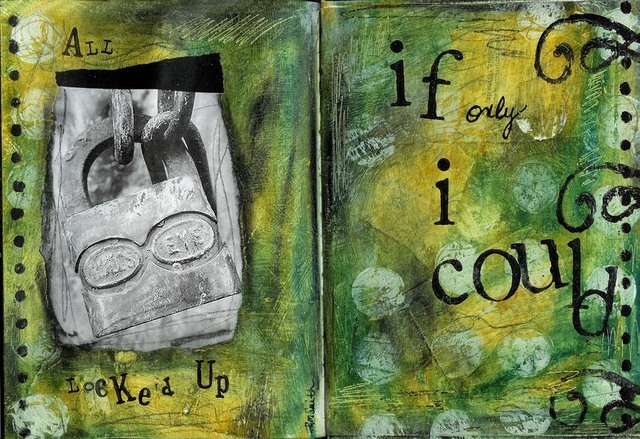 I am often inspired by the lyrics in songs and use them to work through journal pages. My latest inspiration is "Unwritten" by Natasha Bedingfield. This song truly speaks to me and where I am right now in my life. I hope you find it as inspiring. I've posted the words here as well as an audio file. I love the line..."I break tradition, sometimes my tries, are outside the lines. We've been conditioned to not make mistakes, but I can't live that way." Don't be afraid in all things to be able to make mistakes and learn from them! This is true in so many areas of our lives. Wanting to try something new? Wanting to get out of your comfort zone? Wanting to be the real you? What is holding you back; making mistakes, worried what others will think, lack of confidence, lack of knowledge? "Live your life with arms wide open, today is where your book begins, but the rest is still unwritten!" Be brave! Be confident! Have courage! Today!